Dr. Lakshmi Ratna M is a Gynecologist in Hyderabad and has an experience of 31 years in this field.Dr. Lakshmi Ratna M practices at Nice Hospital in Masab Tank 31 years HOD in Fernandese Hospital till March – 2011 Division Diretor,and Apollo Cradle in Jubilee Hills, Hyderabad. She completed MBBS from Osmania University in 1980, MD – Obstetrics & Gynaecology from Osmania University in 1985 and DGO from Osmania Medical College, Hyderabad in 1987. I am very glad as my baby is a cradle baby. Wow! The experience I had at Apollo Cradle is incredible. I was under the care of Dr. Laxmirathna. I am short of words to describe the hospitality and interiors the rooms and food was amazing. Highly recommended place for best birth experience. Dr. Laxmirathna at Apollo Cradle had done my delivery. I feel so cared and loved by the staff there. The environment and nurses made me feel at home. I am impressed with the kind hearted staff. The best place ever. Dr. Laxmirathna M was the best skillful doctor whom I respect the most at Apollo Cradle. She is very cool and dedicated human. I appreciate her kind nature and the way she comforts her patients is great. All the team at Apollo Cradle are well-mannered. The food served there was too light and tasty. I was admitted to Apollo Cradle for my delivery under the observation of Dr. Laxmirathna. I am in love with the care and support provided by the whole Apollo Cradle team during my hospital stay. I will be my best memory. Thanks to all the loving and caring nurses and housekeeping staff. Mrs.Lanka lakshmi thanuja – Jubilee Hills, Hyderabad. A friend of mine recommended Apollo Cradle for my delivery. Dr Lakshmi Rathna was fantastic and the nurses are knowledgeable. Dr Rathna is warm, kind, and so easy to talk to. My deluxe room had an AC and TV and it was clean 24/7. There were a couple of medical concerns during the birth, and the staff remained a constant support for us. Mrs.Dr. Mythri – Jubilee Hills, Hyderabad. My relatives recommended me Apollo Cradle in Jubilee Hills. I knew I wanted nothing but best and Apollo Cradle is just awesome when it comes to quality health care. Dr Lakshmi Rathna was very supportive. Her warm personality and superior knowledge make you feel safe instantly. The single deluxe room was nice and inexpensive. Mrs.Urooj Fatima – Jubilee Hills, Hyderabad. I visited Apollo Cradle for my delivery under the care of Dr Lakshmi Rathna and she is just awesome. Right from the front office to the nurses and the housekeeping staff, everybody is amazing. I am so glad to have had her with me all the way. My suite was delightful and had all the amenities of a 5-star hotel. Thank you very much. Mrs Sameena Hussain – Jubilee Hills, Hyderabad. I came across Apollo Cradle while searching for hospitals online. The perfect reviews made me want to visit this facility and see for myself. For my procedure, I was under the supervision of Dr Lakshmi Rathna and her team. She took complete care of me and the nurses were very helpful. My deluxe single room had ample space, TV and AC to make it comfortable. I’d thoroughly recommend Apollo Cradle to anyone wishing their health care to be a positive experience, rather than something endured. Mrs swathi gampa – Jubilee Hills, Hyderabad. A relative of mine told me that Apollo Cradle has one of the best doctors. 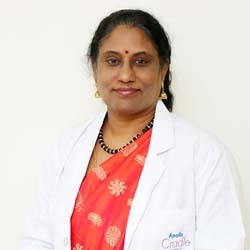 So, when I needed a gynaecologist, I visited Apollo Cradle in Jubilee Hills and was under the care of Dr Lakshmi Rathna. She is an amazing doctor and really helpful. The ambience of the hospital encompasses positive vibes and it is well maintained too. I opted for a single deluxe room which was well kept and comfortable. Their ambulance service is also commendable. My experience at Apollo Cradle was satisfactory. The staff, including Dr Lakshmi Ratna, nurses, housekeeping, front office are all very efficient. We opted for the deluxe single room which had all the basic amenities and sanitation was also taken care of. The only thing which disappointed us was the food! The food was not at all good. I would recommend Apollo to work on it. I’m so happy & glad that I chose Apollo Cradle for my delivery. Right from the doctor, nursing staff, front desk to housekeeping, the entire team at Apollo Cradle was extremely helpful and understanding. It has been a great, memorable journey to motherhood. Thanks a lot. It is during such crucial period of life that you need the best support around and Apollo Cradle has lived upto every other expectation and made this journey beautiful and memorable. Thanks to the doctor, staff and everyone involved for this journey. Also, I would like to mention, I loved the little gesture of arranging candle lit dinner. Thanks.